I found Rabblemaster often had a big target on his head in the format, despite being able to take over games. Brimaz was both effective against the meta but also hard to kill with most of the common removal for aggro decks. I felt like my list was already more controlling anyway, so smoothing out my draws with Magma Jet and adding some top end in the fourth Sarkhan felt right at the time. In hindsight, I’m not really sure if the changes were that great, but it worked out well enough for the tournament. I unfortunately lost again in Top 8 to the same player twice (once swiss, once quarterfinals), playing RW Tokens. It would have been nice to have Arc Lightning for that matchup, but Brimaz still put in work and the match went to three games. 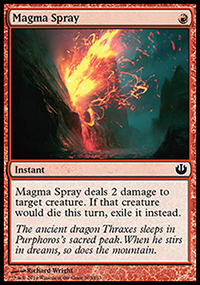 The spot where Brimaz was in the board became two Magma Spray and a third Erase. I expected a field heavy with Sidisi Whip decks based on some intel from a friend who lived in the PPTQ’s hometown, and I wanted to shore up the RG matchup as it seemed a little more aggressive than I’d initially anticipated. I did end up beating RG to advance to the top 8, unfortunately at the hands of a friend, but it was again good to see a successful win-and-in based on ideas I had conceptualized prior to the tournament. But of course, that was yesterday. 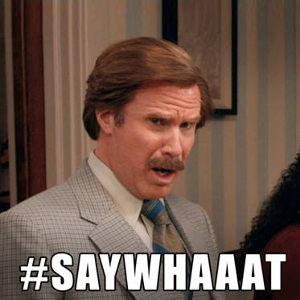 Fate Reforged is today. Fate Reforged hit hard. It was anticipated by most of the people in my testing group that the new cards were going to have a significant impact, and they did not disappoint on opening day. All the testing we had done indicated that almost every archetype needed updating, and that several new brews were possible. To the point of writing this article, I’m still very excited to see what comes out the next few weeks. I’ve heard a lot of talk through the grapevine, and I think we are no where close to done seeing new Tier 1 and 2 decks make big splashes. I’m going to go into detail about individual cards and a variety of decks, but I’ll start things off by showing the two archetypes that I considered for the first PPTQ last weekend. I say considered, because I started with one and switched to the other with 10 minutes left in deck registration. Yep, it was one of those tournaments. Fortunately, it didn’t quite backfire. Originally, myself and testing buddy Brad were hellbent on Jeskai Aggro. I had set it aside after two mediocre PPTQs a few weeks back, but he top 8’d States with it last year and thought it was poised for a comeback. I came over to his house the Thursday before the tournament, and we playtested for hours. Most of the games were Abzan Aggro vs Jeskai and RW Tokens vs Jeskai, but we switched who was playing what often to get a clear picture and played both boarded and unboarded games. 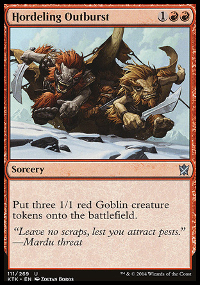 What separates this list from other Red Devotion decks on the interwebs is the removal package and the lack of Goblin Rabblemaster. In testing, both of us independently kept finding him to be lackluster, not adding to devotion as well as just being out of place. It reminded me of when I took him out of Boss Sligh, and also saw that Tom Ross did the same. There’s just some decks that don’t want him, despite how out of control he is when unanswered. The removal suite was changed because Crater’s Claws just simply isn’t Mizzium Mortars. While a developed board can lead to a big Crater’s Claws, especially with Nykthos, in order to survive in this format you usually have to be killing things on the first few turns and it’s a terrible spell for that. I kept hearing the old adage “You’re supposed to be filling up the board in order to create a board state that your opponent can’t deal with when you’re playing devotion”. Sure, that’s partly true, but in this day and age you don’t have Burning-Tree Emissary which was a huge catalyst for that, and you instead have more aggressive Red cards that do different things. This deck is almost half-dash, half-devotion, and both halves compliment each other surprisingly well. 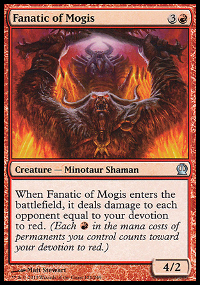 I often found many games where I still had a reasonable devotion count for Fanatic of Mogis, but he wasn’t a crutch that I relied on. I could defend myself against early creatures with the change in burn, let Magma Jet smooth my draws and play less land, then just power in some fliers backed up by my dominant top end. That’s the plan at least. Flamerush Rider was a surprising card that Will keyed me into. While I’m not sure if I like him in the list or not, he’s very similar to Nykthos in how ridiculously explosive he can be. 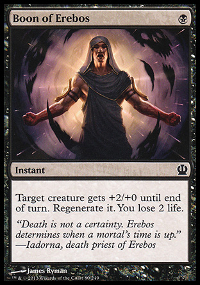 At the low end, you’re copying either Mardu Scout or Eidolon of the Great Revel, which is a lot of damage in its own right and can make mid-combat tricks fairly awful. At the high end, you’re copying either 4 power fliers or. . . The deck would ultimately lead me to a 3-0 start at the PPTQ, humming along nicely with wins against Abzan Aggro, W/U Heroic, and Sultai Control. At this point, I just needed to win the next round and I’d be a lock to double-draw into the top 8. Unfortunately I got paired against a colleague Andy who has been wrecking it up in the last few weeks. He was responsible for my sole loss in the first PPTQ that I top 8’d with Mardu, and here he was back again at the top table. He was playing his tried and true GR Monsters deck, and our battle was one of the biggest haymaker fests in Magic I’ve ever seen. Game 1 came down to a board state with him at 5 life, facing down double Flamewake Phoenix and Sarkhan. He untaps, draws a Shaman of the Great Hunt, and swings back for 16. I was at 16. Game 2, similar affair, similar result. It was disappointing, but I shrugged it off since I knew it was going to be a tough one. 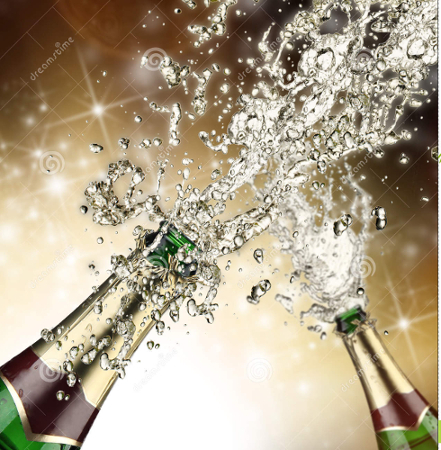 The next round I got into a dogfight with a local player who’s been having a great run with W/U Heroic. We had a few intense removal / protection wars over his heroic guys, and unfortunately he had the extra spell he needed each time. The third and final round was against Abzan Midrange, and despite winning game 2 I was never really contending in games 1 and 3. Sadly, it was a win-and-in for me, but he missed the boat getting 9th place on breakers. There’s still a lot of directions one could go, but I think this list maintains an aggressive posture while being able to defend itself better. One of the nice things is that with the Dash mechanic you can play around Anger of the Gods very easily, and it’s often almost an exclusively one-sided wrath post-board. The deck feels like a Burn deck often, just dashing out guys until you hit your permanent fliers, and then topping off with anything hasty. There’s also many times where you just want to play your Mardu Scout as a Mardu Scout, it really just depends on your feeling out of the matchup and your role. How do we attack each of these? Danny has neither of the “long game” cards I mentioned in the maindeck, and instead moves them to the sideboard. This was a good strategy for week 1, because staying aggressive always helps you punish people trying out new brews or playing lists that aren’t fully tuned. He uses Outpost Siege as a way to get those last few points of damage in, whether it be exiling burn spells off the top, or slamming it before an incoming wrath / removal fest. This deck puts on one of the fastest clocks the archetype is capable of playing, and aims to overload the board in game 1. His Game 2 and 3 side cards basically just give him some outs to tough situations, or that extra smidge of reinforcement for the closer matchups. Monastery Mentor and Goblin Rabblemaster are very fragile, but this deck excels at being able to play them later than turn 3 alongside of something for value. Also, each one of the creatures he’s playing can go bananas if left alone, and given the high threshold that he has of them, it’s pretty much a guarantee that one will stick around. What I don’t like about his deck, and where I think it can be attacked, is his sideboard. Once people move to game 2, his deck is extremely vulnerable to 2-for-1s because of it’s reliance on being aggressive. Cards like Elspeth and End Hostilities just don’t make a lot of sense, I’d rather stay aggressive but just get bigger or add layers of protection. You can’t do enough with 15 cards to drastically change how this deck plays (unlike Abzan Aggro or Jeskai Aggro). more Stormbreath Dragon, more Hushwing Gryff, Gods Willing, Abzan Advantage, and Arc Lightning/Barrage of Boulders are where I’d want to be. 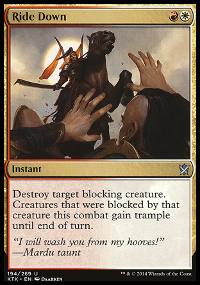 The biggest obstacles I see are wraths, opposing tokens, and lifegain via Whip/Courser. Abzan Advantage was an under the radar card this weekend, but it actually looks phenomenal here. Killing a Courser and boosting your creature at the same time, killing their Whip, Doomwake Giant, or Eidolon, etc, etc, are all fantastic uses. 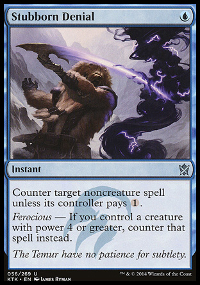 The +1/+1 counter helps you get over or around those cards and sweeper effects as well. Heck, in the Jeskai Aggro deck I mentioned earlier, Abzan Adantage is even featured in the maindeck. Doesn’t seem too bad to me, considering there’s targets in almost every archetype outside of Control, and even there you can still get a counter out of it. Killing an opposing Chained to the Rocks or Heroic enchantment has got to feel great and very unexpected for your opponent. Speaking of Heroic, W/R Heroic made a little bit of a splash. Ultimately though, I don’t think it’s a deck I’d want to be on. 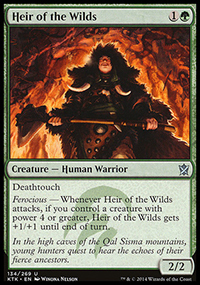 In my experience, I’ve often seen the W/U Heroic deck perform well because of its access to Ordeal of Thassa, letting you draw out of situations that other Aggro decks would be dead in, and Stubborn Denial which acts as extra Gods Willings and anti-wrath protection. If this were Modern, I think the analogous example would be Burn vs UR Delver (with Treasure Cruise), except with the difference there being that Burn can substitute aggressive cards that actually make a difference. W/R Heroic isn’t adding anything that knocks my socks off nor can’t be easily diffused. That’s not to slight Zach Jesse, I think he built his list correctly and it looks powerful, it’s just not what I think gives you the best chance to win. 2.) This is a good segway into Jeskai Tokens. Often heralded as the archetype that “beats the field but loses to the end bosses”, Jeskai Tokens has similar resurgence ability to W/U Heroic. Treasure Cruise is still legal in Standard, and no deck takes better advantage than this one. What I think most pilots don’t realize is that this is not just a tokens/combo deck, it’s a burn deck. Our PPTQ was won by Jeskai Tokens, and his match against my friend Brad in the top 4 showed not only high level play but also the ability of the deck to switch gears. Brad had him overwhelmed on board in the final game with an early Brimaz and removal for his creatures, but Dan (the Jeskai Tokens pilot) was able to patiently dig through his deck with Magma Jets and Ascendancy triggers until he could count his opponent’s life total to zero. 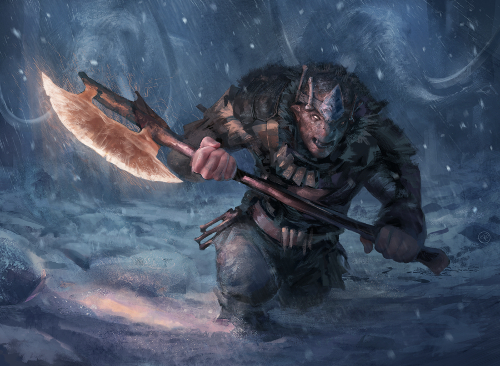 There were many opportunities where there were lines to kill creatures and try to stabilize with a tokens plan, but Dan knew he would get there by staying to the path. He’s not the only one who had a nice finish this weekend with it, the great Tom “The Boss” Ross picked up the deck too and landed in 13th place at the SCG. Bottom line, Jeskai Tokens has the ability to go wide like RW, but it has more outs and more lines, and going into next week where people are going to have better lists, that might be the difference. 3.) Sultai made a splash, with two top 8 placements at the SCG. What’s scariest about these lists are that they are very different, with famous pro Gerard Fabiano choosing more of a control/graveyard manipulation route (essentially splashing for Sylvan Wayfinder), while Ali Aintrazi goes for valuetown. Despite Fabiano winning, Aintrazi’s list seems to be the one amongst popular discussion and there’s not a single card in the list that isn’t straight nasty. I’m not looking forward to a game in which my opponent plays a Frontier Siege into a Hornet Queen, Garruk, or Ugin. This screams out one thing at me. These aren’t the only cards in the discussion, and some of them may not be worthwhile, but at the very least I hope they pique the interest level. I think each of them has a good standing going into the weekend, it will just depend on the archetype you put together with the information. Each one of them either makes removal awkward or Courser/Caryatid, and that’s where you want to be against Sultai. 4.) Abzan is still very much alive, and it put up plenty of strong finishes on the weekend. People will still probably dog it as “not being the best deck anymore” because it didn’t get the almighty first place, but I think it’s still the number 1 deck you have to be focused on being able to beat. Fleecemane Lion, Siege Rhino, and Bile Blight walk into plenty of free wins, so a gameplan is a must. Yes I’ve already mentioned these cards, but I’m bringing them back because they are “live” in any of those matches and thus I think they are must plays if you are in those colors. Arc Lightning isn’t great against Abzan as it’s a little slow, and there’s not a ton of targets against Sultai, but it’s fantastic against tokens and it kills both Fleecemane Lion and Rakshasa, while comboing with other damage sources elsewhere. It’s been a while, welcome back. In the past month we’ve had holidays and life at my job has been quite busy, but I took it upon myself to try and improve as a Magic player and managed to play in five PPTQs. While I’m not a huge fan of the system, if you want to qualify for the Pro Tour it’s one of your only tickets left (besides the last few real PTQs). The process was a good learning experience, allowing me to understand the importance of specific playtesting and when I need to take an extra step outside my routines. 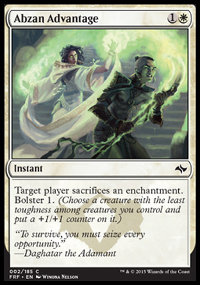 I liked elements of both Bolt’s and Mize’s lists, but ultimately fell short at the PTQs. I started 2-1 at the first, before collapsing to finish 2-3. At the second one it was a quick 0-2 drop. The deck, while having raw power, doesn’t have many ways to pull out of poor situations or keep the attrition going when things slow down. And while the PPTQs were small, they were filled with mostly tier 1 decks so most games were pretty tough battles regardless of matchup. I’d often find myself winning and losing against the same decks (aka being on both sides of the fence in the same matchup). A talented friend and I were talking after I had lent him the deck for an FNM, and he felt like some of the creatures were underpowered and would be better off just being burn spells. I think that’s probably a wise direction, although diluting it too much might just make it a bad two-color version of something you could do better with three. There’s also the more Monsters style route, ramping into Genesis Hydra and the like. There was a local player piloting that at the PPTQ I attended this Sunday, and he went 4-0-1 into top 8 with it. Xenagos, Pollukranos, and Stormbreath are all potent threats that the majority of decks in this Standard format have a hard time dealing with. After the first two tournaments didn’t pan out, I started looking for a change. There wasn’t anything glaringly wrong with my Mardu list from before, but I had grown a bit tired of playing with it and knew it was going to take time to figure out what changes to make to it in order to solve the tougher matchups. 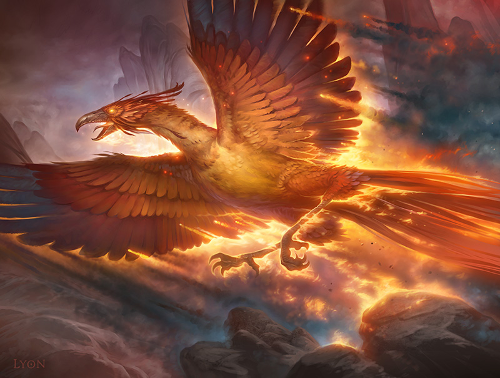 One of our local area pros, Brian Kowal, had top 8’d a real PTQ with a new take on Jeskai Aggro. 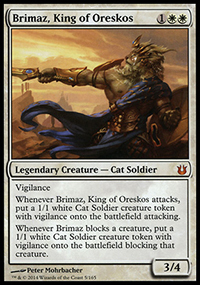 His list had a few distinct cards that I was intrigued by, including maindeck Hushwing Gryff and Brimaz, King of Oreskos. Siege Rhino. Hornet Queen. Doomwake Giant. Wingmate Roc. Eidolon of Blossoms. Satyr Wayfinder. Sidisi. All great cards, and all shut down by that little three mana bird. He proved to be quite potent in the two PPTQs I’d play with him. He’s been tried before, and people usually had polarizing opinions on his effectiveness, but once on the battlefield he forces your opponent to remove him or have half their cards become extremely limited. In the matchups where he’s not that strong, he’s still a flash creature that can help you catchup on that all-important tempo, and he’s a flier which is a big deal in this format. The list was thrown together fairly quickly as Brian audibled just before the tournament began, but a lot of the ideas were in the right place and it paid off for him. For my first go with the deck, I cut the Wingmate Rocs which were a non-bo with Hushwing. That situation doesn’t come up that often, but in testing it did come up for me some. 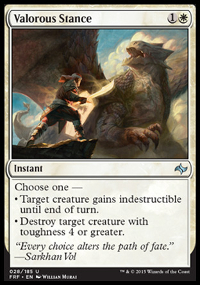 I replaced them with Stormbreath Dragon, which Brian said was also a consideration since it matches up well against Abzan’s removal and white creatures. I removed the Jeskai Ascendancy and Spirit Bonds out of the board, both of which were never used by him, and instead put in more Gods Willing, Suspension Fields, and Prognostic Sphinx. At the first PPTQ with the list, I lost my win-and-into top 8. It was a small tourney (18 people) and I definitely made a lot of mistakes as I was getting my sea legs with the deck having only played a few games the night before online with it. It felt like a better choice than the RG deck, given the fliers and high toughness of Brimaz, but the attrition matches were still grinding me out at times and the deck felt like it needed some real draw power. 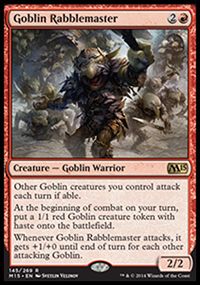 I had a lot of terrible mulligans and land draws, so for the next tournament I added 2 Dig Through Time to the main, and cut the curve down a bit by removing a few Phoenixes for Goblin Rabblemasters. In the sideboard, I created a more controllish package rather than the “protect the queen” plan of Gods Willing. While that strategy can be viable, especially with the high number of guys you can just keep playing (even if the first one gets killed), I didn’t like how you had to setup situations for it. I also didn’t like that it was a dead card if your board was cleared away, a thing that happened on several occasions. Ultimately, I finished 3-2 at the second PPTQ I played it in, and while it felt like the changes were good (especially Dig and Keranos out of the board), it didn’t look like the correct deck choice for this season. There was one PPTQ left before a long break and the new set. The night before, I didn’t know what to play, and the piles of cards in my deck case weren’t helping. I scoured the interwebs, watching versus videos, scrutinizing over Jeskai lists from Grand Prixes and opens, but nothing felt like it would solve the big troubles of today. Abzan Aggro. Jeskai Tokens. Specifically the former had been a popular deck since Andrew Tenjum, a well known SCG Pro who goes to school in my city, finished well with it at the first 2-day open they had. The deck was everywhere, and it was beating me. If I had stuck with Jeskai, David Ochoa’s undefeated list at Grand Prix San Antonio was my fruntrunner choice – Here – because of the counters it had, but it still didn’t look 100% correct on paper. Every article you read or pro you talked to usually mentions that Jeskai is a dog to Abzan too, and while any Standard matchup is relatively close in this era, I didn’t want to be the “probable” underdog. Furthermore, Abzan Aggro and Jeskai Tokens were about as aggressive as Standard gets (outside of Red Deck Wins and WU Heroic), so I figured if I can figure out how to beat them more often, I’d probably be mostly good elsewhere. It was getting late, so I changed gears. I proxied up Tenjum’s Abzan Aggro list, and put together the closest thing I could think of that is “sometimes” regarded as having a solid matchup against it; Mardu. I used a mostly stock list to start, and played a number of goldfish games at my kitchen table with the two decks vs each other. While not the best form of testing, I needed specific information on sequencing and what stuff was truly better than others when it came to card selection. Despite the late hour, this process proved invaluable. I stayed up until 2am, making changes to the list every 5-6 games or so. While I didn’t want inbred testing, I did really want to beat this deck and I had a good idea of what I needed to beat the other format contenders. Eventually, I had still had a mostly stock Mardu deck but it was doing OK.
Part of the idea for the changes came from my old RW list that I played at the SCG Open in Minneapolis. That list fell short in tournament play but had been great in playtesting with my friends, and I think a large part of its ultimate failure was that I was running too few lands, not enough gas, and missing good removal outside of Chained to the Rocks. That missing piece was Crackling Doom main, and Thoughtseize sideboard. As I prepared to switch back to the RW deck at my kitchen table, I had the thought that it might just be worth staying Mardu, but emulating what was best about the RW deck. In my suite of games, Chained to the Rocks was the best card, along with Doom. Maxing out on both seemed natural in a format that tends to be creature heavy with a lot of must answer threats, and being able to Thoughtseize post-board against Control decks or decks with heavy Planeswalkers was a nice replacement effect for some of these dead cards. Chandra and Magma Jet fill in key roles for this deck despite not being cards you’d scream to have for this metagame. Chandra’s +1 ability is often removing a blocker in a format where people tend to play one creature a turn, and in a deck where your creatures are often resilient or pushing in the last few points of damage, this falter effect is invaluable. Her ultimate is a semi-real threat as you have enough burn in the deck to usually hit something, and her exile ability provides the needed fuel that was missing in many builds. 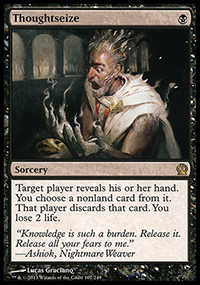 You miss out on the lifegain and 2-for-1 ability that Sorin provides, which can be big in some games, but I think the change felt better because of what THIS particular deck is trying to do. In a deck with Hordeling Outburst, Sorin is probably the better call. In this deck on the other hand, you’re usually playing a controlling or tempo role early on, so by the time Chandra lands it’s often on an empty battlefield or against threats not significant enough to remove her. And Chandra on an empty battlefield is a pretty scary thing if your opponent doesn’t have the Hero’s Downfall to answer her. Lastly, it doesn’t hurt to have a card that is reasonable against tokens in combination with Arc Lightning and the rest of your creatures. 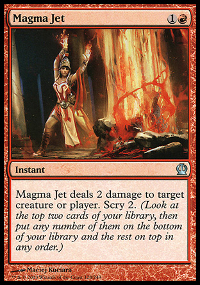 Magma Jet is a necessary crutch against Abzan Aggro, as being able to kill Rakshasa when your opponent taps out or plays him early is an important part of winning the matchup. Jet also provides more gas to a deck that is hungry for it, as again you are many times just playing draw-go. Like I mentioned in my last article regarding tempo, the ideal is to remove their threat and then play your own, and this is one more card that makes it a possibility. In matchups where it is bad, you can still dig for your better removal or even side it out if you don’t feel you need the extra scrying power. Usually I kept it in for most matchups, as there always seems to be something to hit with it which allows you to save your other removal for better threats and I think the scry is very important. Abzan Midrange and Sultai are probably the few exceptions. The creatures in the deck are all trying to accomplish specific tasks. They don’t look much different then the typical Mardu build, so I’ll address the key difference: Ashcloud vs Butcher, and no Hordeling Outburst. While Butcher and Outburst combo well together and help you win races at times, neither is particularly well suited against an Abzan matchup. Butcher is killed by most of their removal, and Outburst doesn’t “do” anything on its own. When my opponent has a Courser of Kruphix out, I don’t want three 1/1s. 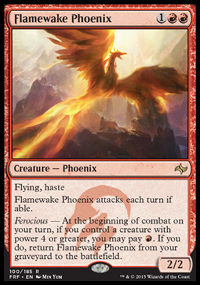 Ashcloud Phoenix dies to some of their removal like Abzan Charm, but he’s certainly harder to kill. 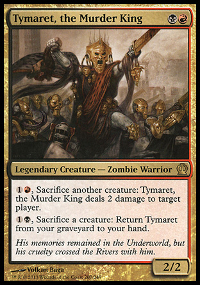 He’s also good in the Mardu Mirror, essentially requiring a Chained to the Rocks to deal with and matching up nicely against their Butchers and Rocs. And lastly, he’s great against Control which is something a lot of Mardu pilots struggle with. Don’t get me wrong, Butcher/Sorin/Outburst builds are still very good. I wouldn’t fault someone for going that direction and its clearly had success on a high level in the past (including my own). But this deck was tuned with the current state of things in mind, and I think it attacks from an angle that often requires very specific answers. Many of my opponents at the last PPTQ were just blown out in every game we played, as this build has some incredible power once you take control. The phrase, “twelve you” was uttered quite often, and its because once you clear the board and get to four mana, “things get real”. Another reason for the changes were due to my sideboarding. I knew I was going to get somewhat more controllish post-board, but I didn’t want to change my deck so much that it becomes just a bad control deck like many of these archetypes are doing these days. Having to take out Outbursts in addition to other stuff just felt awful, so in the instance of this build you’re basically just cutting some seekers and rabblemasters when you’re on the draw and bringing in Angers, Brimaz, Glares, and some of the other cards where appropriate. On the play you can continue to be a beatdown tempo deck, and just spruce up some of the removal. 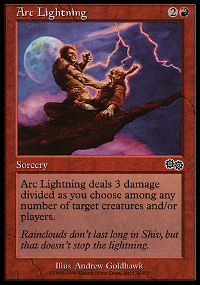 Arc Lightning, Magma Jet, Lightning Strike, etc, are often cards that can become the better removal from the board. Against both Abzan Aggro and Midrange, Glare of Heresy and Utter End are both a lot better, especially since they plan to bring in mostly white Planeswalkers and it hits all of their creatures aside from Rakshasa. 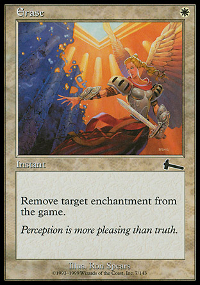 Seeker of the Way is always the predicament of a card, being great on turn 2, but pretty lackluster beyond that. He’s not the worst in the mid game where you may just want to cast multiple spells a turn, but his value definitely diminishes. I’m fine if someone wanted to run 3 here, and have been on those builds a lot, but since I’m only running 12 creatures maindeck (15 if you count Sarkhan), I’d prefer to maximize my chances of having him early. He’s also especially good with the amount of early burn spells, often meaning you can trigger prowess and remove blockers the turn after you play him. Just be sure to not be forgetful like I was in my top 8 match where I gave him prowess only to have him get Abzan Charm’d. The struggle is real. I’ve talked a lot about Abzan, but this deck is well prepared for the rest of the field too. Against Sultai you have Thoughtseize, Anger of the Gods, Erase, and Utter End. These are all cards that can punish them pretty good, along with the amount of flying that basically only gets stunted by their Hornet Queen (which the other board cards take care of). 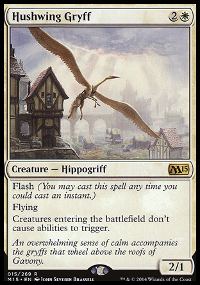 Arc Lightning is also a soft answer in the maindeck to that same problem. Against Jeskai Tokens, Arc Lightning, Anger, Glare, and potentially Erase all put in double duty while Brimaz provides a very difficult blocker for them. WU Heroic is a naturally good matchup, and it only gets worse for them postboard. Sure, they can still win some games where they have the infinite Gods Willings, but it’s a very uphill battle for them. Control is probably still tough, but you’re playing tempo cards. So as long as you don’t overextend and bring in your Thoughtseizes and Utter End you should be good to go. You could also bring in Brimaz if you just want another difficult to answer threat (which I’d probably cut small burn for). One of the tougher matchups is Temur or RG. It was a deck I didn’t expect to see a lot of at the PPTQs, since frankly I seemed to be the only one around here who thought it was good, but at the last PPTQ I went to it probably accounted for almost half the room. This Mardu build doesn’t have many answers to Stormbreath Dragon, and their raw aggression can force you to have instant speed hard spot removal which this deck doesn’t have a plethora of. 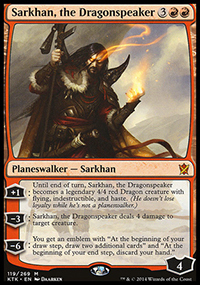 You do still have Crackling Doom, Thoughtseize, Sarkhan, and Ashcloud Phoenix to combat him, but that only goes so far. I went 1-1 against RG in the tourney, and often it was much of the same when testing against my own build. If you wanted to make any changes to the Mardu deck, I’d probably start here by including a Murderous Cut or two, probably over 1 of the Arc Lightnings or Jets in the main. Correct bad attitude – I was fairly salty after my losses, it’s still something with my game I need to improve. I try to be a friendly cordial person with my opponents, but the stress of everyday life and not obtaining all my goals with this game gets at me sometimes. Still, that’s no excuse, and I will try everyday to get over those hurdles. I think being mature and letting others enjoy the game as much as you do is an important piece in being a tournament Magic player. When you playtest for a tournament, make sure you actually play the games against the specific matchups you need to. I would have crashed and burned at the last PPTQ had I not stayed up and become intimately familiar with the Abzan Aggro matchup. I won’t let that same mistake happen twice. Grab a buddy, carve out the time, and make sure you both get up to speed on what you need to, not just jam games against each others deck of choice. Realize when your deck isn’t competitive. I know this is kind of an oxy moron since I refuse to play Abzan, but it’s not so much that you need to play the quota “best deck” but rather that you need to play something that can actually hang. It took me too long to get off what I was doing and move on, but you have to do what you have to do to win. If you want to be the best, you may have to give up on the rest. This PPTQ season involved missing some time from family, work, and things I really enjoy. It wasn’t easy to make a run at it, but the flipside is improvement at a hobby I’m passionate about. Maybe once you get to a certain skill level you don’t need as much time to recognize what works and what doesn’t, or maybe you just need to be born with the correct brain. Either way, you have to fight for it. The end result of the last PPTQ was that I was 3-1 going into the final round. I could draw in with my opponent but he wished to play for seeding since if he lost he would still be in. I wasn’t super happy about it (sorry Justin if you read this, you had every right to want that), but we played and I won strongly 2-0. It was Abzan Aggro, and the practice made perfect. I made top 8 as the 2nd seed, and was rewarded with homemade pie from the store (Thanks Netherworld Games! ), along with the ol’ box of Khans. I unfortunately lost in the top 8 to my friend playing Abzan Aggro, but the three games were close, coming down to me being 2 damage short of getting there. He advanced and ended up winning the PPTQ, so all in all it was a nice end to the run. And not only did the result make me sure I made the right choice, but also the fact that half the top 8 were people I had played before and knew I was capable of beating again. The deck was good, and if you like Mardu I’d definitely sleeve it up next weekend and jam some wins.